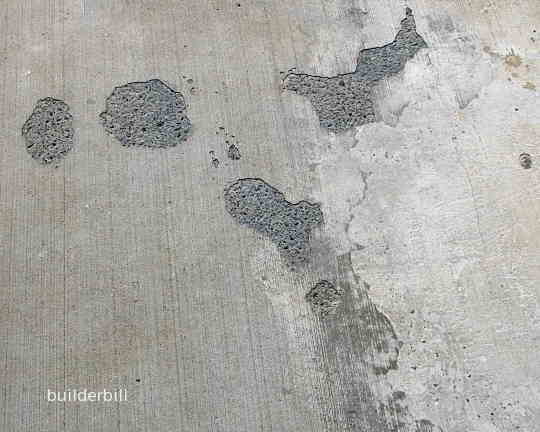 Faults on finished concrete, caused by entrapped air or bleed water below the surface. Blisters are caused by a couple of reasons. The finishing process was started to soon and water was entrapped under the layer of slurry that formed the surface. The bleed water should be gone before the trowelling begins. In the case here it is almost certain that the finishers ran out of time and the concrete "went off on them" before they could do a proper job. the main reason for this is probably tried to do too much for the labour available or it could have been a particularly hot and windy day. 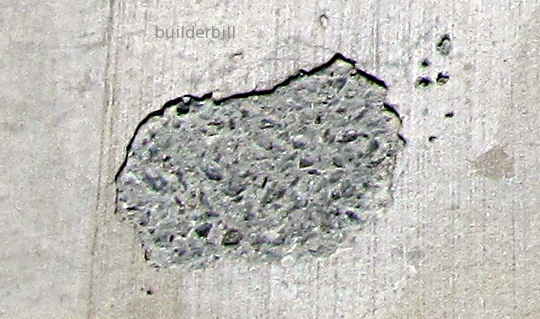 Either way it looks like they got some sort of a finish to it by adding water which would have diluted and weakened the cement slurry which forms the surface layer, or they even added some fresh sand and cement slurry which did not fully bond to the already setting concrete. It may have looked OK at the time, but six months later this is the result.